In January 1942 the German Propaganda Ministry announced the establishment of the Free Indian Legion. 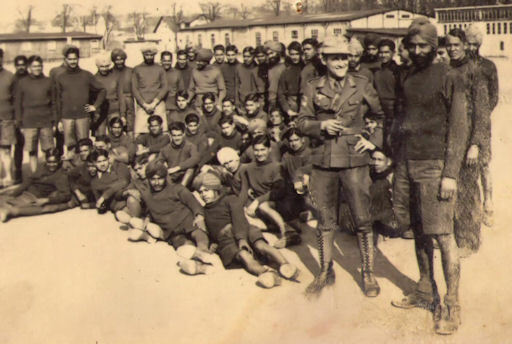 Indian prisoners-of-war were transferred to a camp designated Arbeitskommando Frankenburg where military training was initiated by German officers and NCOs. About 300 volunteers were later transferred to Konigsbrück near Dresden in Saxony where German Army uniforms were issued. A specially designed national arm badge in the shape of a shield was worn on the right upper arm, with three horizontal stripes in the saffron, white and green Indian national colors and featuring a leaping tiger superimposed over the tricolor and with the legend "FREIES INDIEN" in black characters on an integral white background above. Uniforms were of the German army pattern but Sikhs in the Legion were permitted to wear a turban as dictated by their religion instead of the usual peaked field cap. The recruits now constituted the Legion Freies Indien of the German Army and took their oath of allegiance in a ceremony at Konigsbrück on 26th August 1942. The ranks of the new Legion were swelled until it eventually boasted more than 3,000 members and was referred to as Indisches Infanterie Regiment 950. The Indian volunteers of the Legion saw service in The Netherlands, France and Italy before their eventual withdrawal to Germany, transfer to the SS and redesignation as the Indische Freiwilligen Legion der Waffen-SS.